Dharma Forest: A New Series: Heng Sure's Writing! Incense burned in the golden urn. More static from the speaker tower; "The Lord Mayor's car is still not in sight; can you keep the mantra going another ten minutes?" asked the MC, his T-shirt stained with sweat. Waves blessed the pier and soaked my cloth shoes. The red sun climbed the rim of the reservoir and lit up the eyes of the dragon boats. Buddhist monks from our order have joined Calgary's Dragon Boat Races four of the last five years. Each year it seems a festival of incongruities; multiple realities juxtaposed. Westerners looking East; Eastern ways come West; vendors selling out; sages looking within; drummers to the right, dragons to the left. The races have become a symbol for life's journey: a team of strangers sculling a narrow wooden shell, guided by a painted icon,while a relentless drum beats in the stern. Some boats cross the waves and safely reach the other shore; some boats go down with the drum still pounding. Were your eyes dotted? I remember the initial invitation call in 1991 from the Abbot in Calgary. I fumed: "No way! Monks don't race dragon boats. We don't race. We meditate. We even retreat! What could be slower?" He soothed: "We won't race, we bless. We dot the eyes. Relax. It's a ceremony." I replied, "I'm worried about your meditation. Any special states recently?" He insisted. Dragon Boat Races had started in Hong Kong years ago as a Chinese Culture festival. 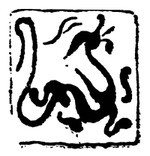 The ancient poet Ch'u Yuan jumped in the river as a political protest. Since his suicide, sympathizers have been setting out in dragon boats, floating plantain-wrapped "zungzi" (dumplings) in the rivers and hoping to guide his spirit to rest. Buddhist monks were traditionally invited to bless the boats and dot eyes on the dragon heads, so why not us? I whined: "But I don't know how to dot dragon eyes. Suppose we do it wrong? Suppose the boat sinks? What if dragons hold grudges? Did you think of that?" He gave reasons. It seems that Mrs. Lee overheard at mah-jongg that the Race Committee was looking for real monks this time. The first year they couldn't find any. At the last minute, somebody, innocently, checked the yellow pages (under charlatans?) and fished up the infamous Master Lu, and his Black Tantra group to bless the dragon boats. Mrs. Lee's husband, the "kung fu policeman," was at dockside; he said people got suspicious when the Black Tantra troupe arrived in a trio of ebony Lincoln limousines. Their chanting made everyone edgy. After the service the group's PR person, credit card slider in hand, made a sales-pitch. He offered to a lucky few, sincere seekers, a secret path for riches or enlightenment, details available in the limo. When he repeated his line in rapid Quebec French, the MC pulled the plug. This year they wanted a more traditional group and were we interested? Four years of races later, the hosts still hadn't worked out the sound system. The PA squealed on and off; I heard later that it rang loud in the exhibit area up the trail. I can picture the Canadians stepping from their vans to the parking lot's dewy grass, greeted by the rhythm of our tapping wooden fish and fractured voices floating from trees: "**wheeet** don't seek Bodhi afar... *spatz* wisdom... **pop**compassion... **crackle** your own mind...."
The microphone died again. Incense smoke gracefully rose and fell as our disciples stepped gingerly onto the crowded floating pier. I closed my eyes and chanted the Great Compassion Mantra. I opened my eyes and in front of me the Lord Mayor of Calgary, then a Hong Kong tycoon and his tiny wife, then the local MP, an oilman from the Alberta prairie, followed the monks in file along the narrow quay. The VIPs, wearing multi-cultural smiles, looked vulnerable, wide-eyed, uncertain, willing. Their hands clutched red-tipped Chinese writing brushes. This is the moment that brings me back every year. Stopping at each long boat, before painted dragon heads that managed to look silly and savage, amusing and ancient, they reached out the brush and dotted a cinnabar eye. In that moment I saw our human family from campfire to computer, all of us together in the dark and wanting to see, sparking a light of wisdom that breaks gloom gathered for a thousand years. The sound man found the glitch; the microphone in my hand boomed and echoed with the mantra; up and down the reservoir perching gulls and terns flapped up, feet straining, beaks gasping, alarmed, eyes scanning for the next safe branch. Overhead, for a moment I thought I glimpsed Gwan Yin Bodhisattva, the Enlightened Being of Great Compassion, standing on a huge dragon directly above the reservoir. She seemed serene, amused, compassionate, patient through the countless autumns. I looked again and no trace remained. I am a student here in Calgary, and I believe I have met you only once during the 20th anniversary of Avatamsaka Monastery. I didn't get a chance to meet you, but I was finally able to see you, which made me very happy. Thank you for this post, I really enjoyed reading it, as well as your book "News from True Cultivators" It was very enjoyable and very inspiring. I wish you would visit Avatamsaka Monastery again, I would love to be able to meet you and chat with you, it would be amazing. Ooooh, I love writing classes :) I really like this piece, particularly the beginning and your choice of words. Do you still go to Calgary to see the Dragon Boat races? This sentence reminded me of so many things...wonderful writing! "In that moment I saw our human family from campfire to computer, all of us together in the dark and wanting to see, sparking a light of wisdom that breaks gloom gathered for a thousand years."